The most significant impact today within the Localization space is in the realms of Artificial Intelligence (AI) and Machine Learning (ML). There are machines and software available today that not only understand spoken words and convert them to text, but also translate them to a target language. Many of these tools have advanced learning capabilities that help them improve their output over time, when used by a large number of practitioners. While AI is still far from making the human intervention in Localization redundant, it is promising to reduce cost and cycle time significantly, while helping Media & Entertainment (M&E) companies manage larger volumes of content and achieve faster time-to-market. With AI tools rapidly gaining popularity in the market, Localization vendors are also revamping their entire approach to managing content, including workflows and talent requirements. How does AI impact Localization workflows? Traditionally, this is a 3 stage process – (1) Transcription (same language pair)/Translation(different language pair) (2) Timing (3) Quality Check. The process includes efforts of freelancers and part-time resources, and entails the exchange of multiple files, emails and phone calls. The entire process is relatively slow, error-prone and non-scalable. It also poses major security risks as content is accessed by multiple people in different locations. 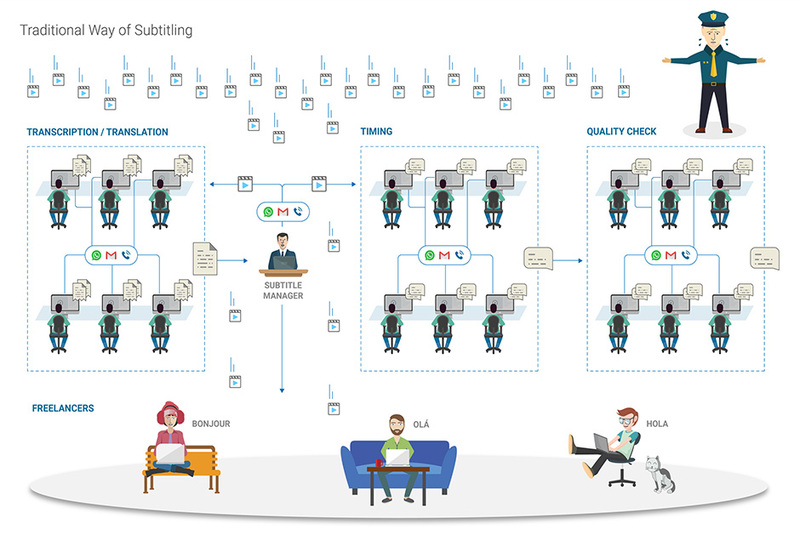 The AI-assisted Localization process, in comparison, can leverage several commercial off-the-shelf tools available for Transcription. Some of these are made by technology giants like IBM, Google, Amazon, Microsoft etc. There are also offerings by many promising start-ups which yield equally good results. Many of the offerings improve the process by being able to identify different speakers, time-code the transcript accurately, giving the confidence level of recognition, providing adaptive memory tools etc. Some include dedicated support for feedback and enhancement. Language translation using AI has also improved by leaps and bounds over last couple of years. The advanced tools in this space leverage Natural Language Processing (NLP) and deep learning using Convolution Neural Networks (CNN) to bring context and grammar to translated phrases. The level of accuracy of the output depends on the source and type of the content. Having said this, AI has several limitations in the context of Localization. When working on content with considerable cross-talk, background noise, heavy accents and a lot of high context content (like sarcasm or humor), the use of AI tools becomes challenging, and the results are hard to work with. Within text translations as well, complex sentences often result in gibberish and it’s often easier to translate content in such cases from scratch. Nevertheless, the industry is witnessing the rise of extremely effective tools in the market for auto-translation and transcription in certain languages, and for specific kinds of content. When working with clear audio files with speakers that annunciate their words, AI-driven results are far better. Even with text translation, basic sentences produce highly accurate results. Here, users can rely on tested tools that support high quality output and assist them in delivering within a faster turnaround time. In such cases, the workflow is quite different from the typical scenario described earlier. The first component of the process – Transcription – gets removed, as an automatic script is received when the text, video or audio files are passed through the tool. Removing one layer of the process helps speed up final delivery, which is critical in achieving faster time-to-market. 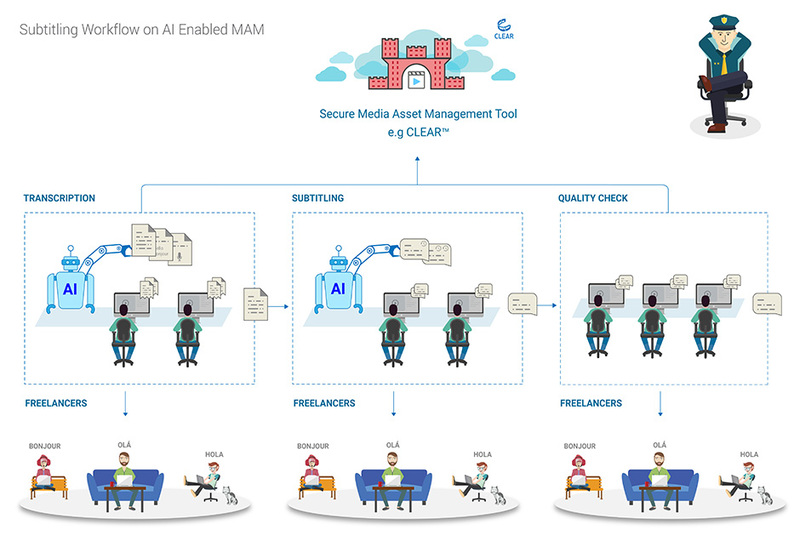 Other aspects of the workflow can also be orchestrated by sophisticated AI-enabled MAM (Media Asset Management) solutions. These provide a secure way of managing content and collaborating with vendors and freelancers, acting as a one-stop solution for Localization experts. Such solutions include functionalities for Work Order Management, and have the ability to generate and adjust time codes, keyboard shortcuts and perform basic Quality Checks (number of words within a shot boundary etc.). Such AI-enabled solutions help deliver Localization output faster by facilitating seamless collaboration across multiple stakeholders, while simultaneously eliminating the risks of piracy by providing a secure platform to share content. How does AI impact talent sourcing? No file can move through AI alone without adequate, human-led QC. Even for the areas where AI is currently producing successful results, it’s extremely important to ensure that the right quality talent is in place to re-check content for overall accuracy. Stray errors can always creep in, and razor sharp expertise is needed for review. For instance, within Subtitling, every word needs to be captured precisely and the original intent of the dialogue has to be upheld. Often trans-creation of the original content is required to effectively reach out to the target audience. An analogy, for instance, cannot be translated with a tool. Similarly, poetry will sound awkward if literally translated. Hence, having the right talent on board in combination with cutting edge AI tools is critical to delivering top notch quality. In terms of talent sourcing, the average skilled resources specializing only in manual transcription can be potentially replaced with high-skilled resources with editorial specialization. How important is AI to Localization businesses? Today, if a Localization provider is not in tune with the latest AI advancements, it is easy to fall behind and lose a considerable chunk of business. To stay ahead of the competition, it is vital to invest in AI-related R&D and implementation efforts, while keeping abreast with the most effective tools available in the market. It is also extremely important to build a strong Localization memory bank over the years, as this sharpens the results of auto-translations and also shortens turnaround time. Whether it is Localization, or any other industry vertical, AI has immense potential to influence the future, and this very fact has professionals across the globe excited to embrace transformation that can help them achieve their business goals.